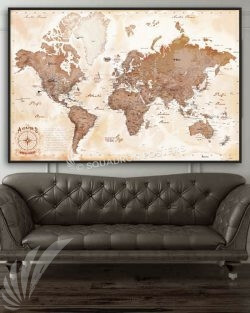 “The Aviator’s Map” – push pin travel map wall art by – Squadron Posters! Printed on Artist-Grade canvas and suspended in the middle of a floating frame. This map features every major active Air Base in the world and many small, lesser-known bases. Use any push pin from Amazon or your local store and insert the pins directly into the canvas and solid core. Massive Size: Over 4ft wide and 32″ tall, this map dwarfs most push pin maps on the market. Canvas Quality: Artist grade canvas with a semi-gloss finish allows you to wipe it clean with a damp cloth. Print Quality: Archival-grade inks hold up to UV rays and ensure this piece lasts to be passed on to future generations. Content: We spent three-months perfecting this map. Air Bases: It has over 150+ Air Bases including Navy, Air Force, Joint Base, Headquarters and coalition partners. Historical Sites: International Space Station (ISS) Orbit Path, Wright Brother’s First Flight, First Manned Balloon, The Glider King, Breaking the Sound Barrier (Bell X-1), Amelia Earhart’s last known location, The SR-71 Blackbird’s Record Run for fastest Coast-to-Coast flight, and the Sputnik Launch Site. Roundels: Every Air Force in the world marks their aircraft with “Roundels” a specific icon to help pilots identify friend or foe while airborne. Every Country with an Air Force has their specific roundel next to the country name. It’s fascinating to compare how Asian countries, Western, South American, and African countries roundels represent their culture. The Aviator’s Map – push pin travel map found exclusively at – Squadron Posters! This entry was posted in History, New Product, Squadron Bar and tagged aviation art, aviator's map, map, military aviator, military travel, push pin travel map, roundels, world map. 2017 Squadron Posters – Armed Forces Mustache March Championship!